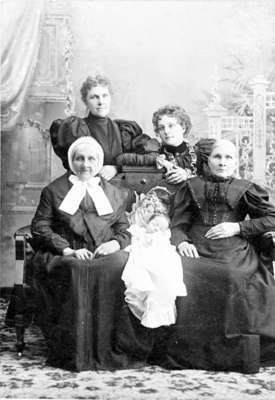 Black and white negative of a photograph showing five generations of women in the Hopper family. The photograph was taken in a studio on the occasion of Mary Hopper's (lower left) 100th birthday. Her daughter, Sarah Colwill (nee Hopper), is on the right. Richard Hopper (1799-1885) of Devonshire, England married Mary Shoddick (1800-1903), also of Devonshire, in either 1819 or 1824. They had nine children: Sarah Colwill (1820- ), Mrs. Matthew Hodson, unknown, Richard Hopper (1827-1889), John Hopper (1829-1901), William Hopper ( -1926), Thomas Hopper (1838-1907), Margaret Hopper (1841-1900), George Henry Hopper (1845-1930). In 1853 they emigrated to Canada settling at Whitby to live with their two sons, John and Richard.